Earlier this year, I bought myself a kitchen gadget that I've been wanting for a long time. A spiralizer, which is used to make noodles and long ribbons out of vegetables and fruit. I'd had it on my wish list for a while, and with the rapid succession of Christmas, our anniversary, my birthday, and Valentine's Day, I was convinced the spiralizer would appear in my hands at some point. But, strangely, it did not! It turns out that Eugene did not want to get it because he thought it would just "take up space" and "never get used." Well...because there is no quicker way to get me to do something, than to tell me "no," I pulled it up on Amazon, hit the one-click button, and had it out of the box and ready to use within 2 days! I LOVE this little machine! It's super lightweight and easy to use--simply insert whatever vegetable you'd like, turn the crank et voilà! Fresh healthy low-carb noodles! 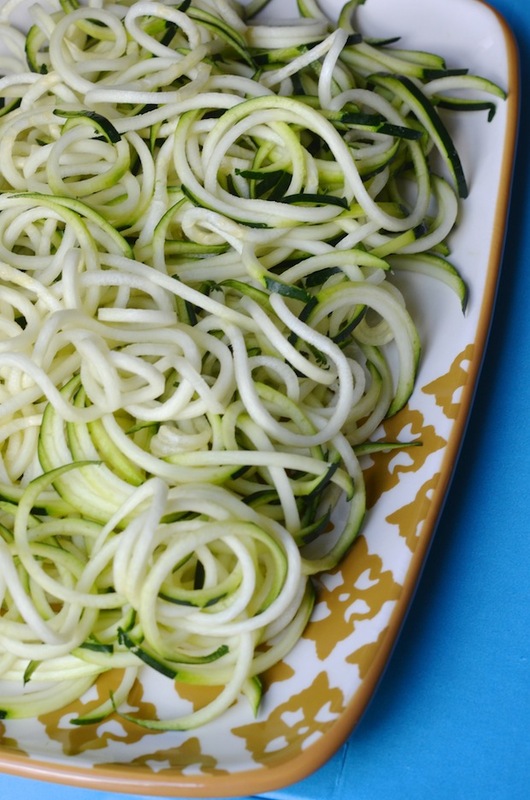 This dish--a Raw Zucchini Noodles with Lemon-Parmesan Dressing was my first spiralizer recipe. I loved it so much that I made it about 4 times that first week. It's quick, filling, and super healthy. I have a big bowl of this at least twice a week, if not more. Even Eugene has turned into a believer, happily gobbling up giant bowls of veggie noodles with nary a complaint. Pass both zucchini through your spiralizer according to manufacturer directions (if you don't have a spiralizer, you can also julienne or slice the zucchini by hand). In a large bowl, whisk together lemon and olive oil. Add the zucchini and toss to coat. Top with the cheese, and toss again. Season to taste with kosher salt and black pepper. Serve immediately, or within 24 hours (the zucchini will soften a bit as it sits in the lemon dressing).